When the depression of the 1930's hit, the nursery grew everything that might possibly sell – evergreens, trees, flowers, vines, even fruit trees. Fortunately the business had been out of debt for many years, so although sales were not great, the business survived. As more land became available, the business expanded. 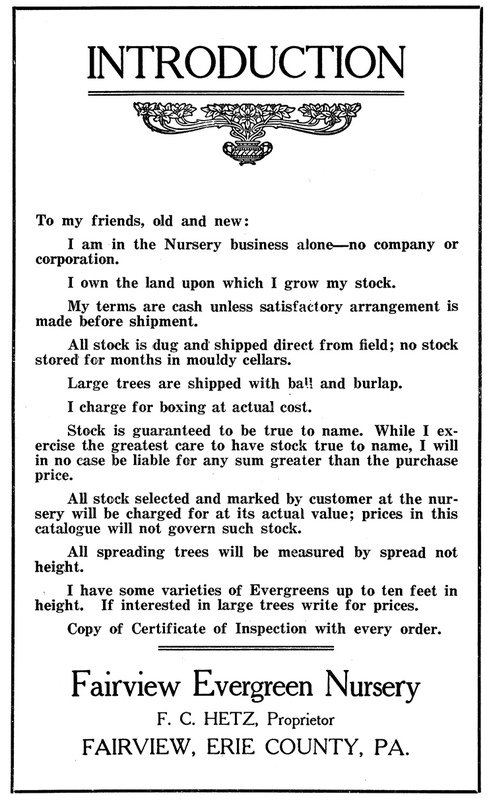 An early 1940's catalog proudly announced, "We are in the nursery business alone – no outside interests or control. We operate 400 acres of which 300 are planted to nursery stock." From the very beginning Frank Hetz had a passion for quality. That meant not selling anything that wouldn't grow for the customer. The product mix might change, but it all had to be A-1 stock. A beef cattle operation was already providing manure to ensure that the nursery stock had good roots as well as good tops. When the U.S. became involved in World War II, the work force, which had been over 40 men, was cut in half as men went to the service or to work in the factories supporting the war effort. Since more and more nursery stock was being sold at wholesale, in large quantities, the family decided to go out of the retail business and sell wholesale only, to the nursery trade. Their decision enabled the partners to cut down on the number of varieties grown, and concentrate on the quality production of the best varieties. To combat the labor shortage and maximize efficiency, the company focused on adding more and better equipment, and for the first time hired migrant workers from Puerto Rico. The first root-pruner for the row crops of landscape sized evergreens was built in 1948. When the first B&B digging machines were built a few years later, their use was made possible by the increased fibrous root system developed by root pruning the plants in the field. officially retired day, he was back out in his beloved seed beds the next morning. He had lived to see his dream come to fruition. He was the founder of one of the most successful nurseries in the United States, and had seen it through good times and bad for more than forty years. His legacy of hard work and attention to detail is the foundation upon which Fairview Evergreen Nurseries has existed for one hundred years. By the late 1950's Frank's grandsons began to work full time at FEN. The first was Frank Bendure, son of Mildred Hetz Bendure. By 1961 Teddy Hetz and Robert "Bob" Hetz, sons of Leroy Hetz, were on board, as was Garth Hetz, son of Clifford Hetz. The remaining four original partners, Leroy, Clifford, and Neil Hetz, and Mildred Hetz Bendure, had been looking for a way to get the next generation involved in the business. They decided to form a corporation, and on January 9, 1961, fifty years after Fairview Evergreen Nursery was founded, Fairview Evergreen Nurseries, Inc. was born. The four second generation partners were the original incorporators, and each owned one quarter of the shares. The original by-laws stated in article 4, "Ownership of stock is limited to direct line descendants of Frank C. and Mary M. Hetz." Now shares of the business could be transferred to the third generation. By the early 1970's, with the addition of Paul Bendure, Stephen Hetz, Richard Hetz, and Christine Hetz Phillips, eight third generation shareholder-employees were active in the company. All seven of Frank C. Hetz's living grandsons and one granddaughter made Fairview Evergreen their career choice. Having second and third generation family members working together made for an interesting time. The second generation was used to working six days a week, ten hours a day. The business was pretty much their life, along with the Fairview Methodist Church for social occasions. The third generation had other interests, which didn't necessarily include working sixty hour weeks all year! The board of directors included all the shareholders, each having an equal vote. If a vote were taken that didn't please the second generation shareholders, they would demand a "stockholder" vote, which, since they still controlled the majority of the shares, would tip any contentious decisions toward their way of thinking. The third generation had to fight hard for "perks" like taking Saturday afternoons off in the summer!